1. In France and Japan, there are certain trains in operation, which run on a single rail. What is the rail system called? 2. The Trains which run underground are very popular in some countries. What is the name of this train that runs along underground tunnels? 3. Which is the country that introduced bullet train service for the first time? 4. In which year was bullet train introduced? 5. Which country has the largest electrified railway systems in the world? 6. Which country has the second largest electrified railway systems in the world? 7. Which is the longest rail route in the world? Answer: The Soviet Trans-Siberian line. 8. 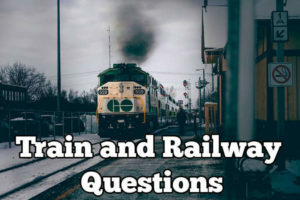 What is the length of the longest rail route and which places it connect? 9. What is the rank of Indian Railways in Asia? 10. What is the rank of Indian Railways in the world? 11. Where was the first railway (train) line opened in India? Answer: From Mumbai to Thana. 12. When was the first railway (train) opened in India? 13. Into how many zones are Indian Railways divided? 14. Which are the fifteen zones of Indian Railways? Answer: (1) Central, (2) Western, (3) Northern, (4) North Eastern, (5) North East frontier, (6) Eastern, (7) Southern, (8) South Central, (9) South Eastern, (10) North Central, (11) East Central, (12) East Coast, (13) South Western, (14) West Central and (15) North Western. 15. Where is the headquarters of central zone of Indian Railways? 16. Where is the headquarters of Eastern zone? 17. Where is the headquarters of North zone? 18. Where is the headquarters of North Eastern zone? 19. Where is the headquarters of North East Frontier zone? 20. Where is the headquarters of Southern zone?